The Boston Marathon is a mere 11 days away and in order to prepare Runner&apos;s World has given us a useful infographic covering everything you would possibly need to know about the race. For example, did you know that the first running of the race was actually called the American Marathon? This year&apos;s marathon will have a larger field than last year&apos;s, as the race expanded to 36,000 entrants due to increased interest over the past year. Over 75 different countries will be represented in the race with the average age of the Boston Marathon runner being 43-years old. 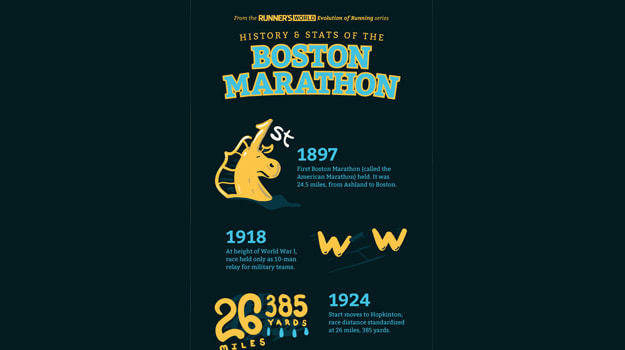 To find out more about the history of the Boston Marathon, head over to Runner&apos;s World and take a look at the full infographic.